Happy ANZAC day. Today some of the Australian and New Zealand cyclists held a short remembrance ceremony at 5:30am. I slept in slightly later (6am) and missed the ceremony. Rest days are a chance to catch up on maintenance, laundry and other tasks as well as to rest. Today my big goal was to find a fleece since mine seems to have been lost or disappeared in Egypt. Our nights have been cool (4C or about 40F) even though it will warm up more than (25C or 77F). There is also still chance of cold rain in South Africa so want to be prepared. 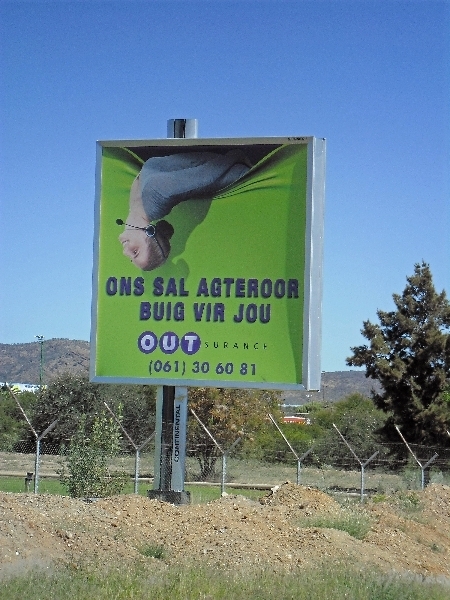 Photo below shows how Afrikaans is similar but not quite same as Dutch as phone company tells us they will bend over backwards for us. Windhoek reminds me a bit of Arizona/New Mexico deserts. There is light vegetation and underneath one can see sandstone. The humidity is low and the buildings are set up to be efficient for desert heat. The stores are also more “western”. For example, on our way in there was a bike shop set up much the same as shops in US and carrying similar gear. Despite hot daytime temperatures, I guessed this would be first larger city that had two key aspects that might lead to a fleece sweatshirt: colder temperatures and larger people. 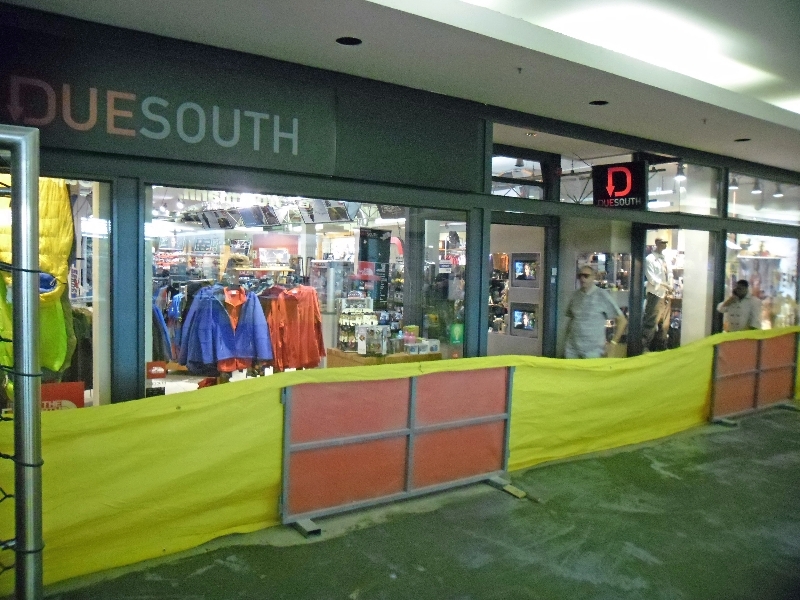 This morning I cycled over to the large mall in town. I found a shop that carried many of the same things REI might carry in US – though the store itself was smaller. Most importantly, I found a fleece in size XL. Bought a wool hat for good measure as well. Having accomplished main tasks, worked through the mall and the Super SPAR grocery store before cycling back. 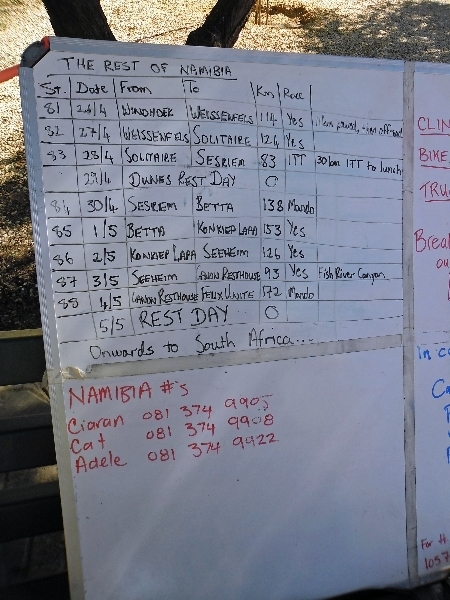 Ride distances schedule has been posted for our upcoming eight riding days in Namibia. All of it is off road, expecting lightly traveled gravel roads. Three days (114km,124km,83km) bring us to Sesriem for a rest days at the sand dunes. Five remaining days (138km,153km,126km,93km, 172km) bring us to the last rest day near border of South Africa and Namibia. Unlike some of the off road in Sudan, I look forward to this off road riding as I expect it to bring us through some beautiful desert scenery and sparsely traveled places. (Traditionally on one of these days the “Naked Mile” is cycled in one of the most remote sections). I also expect this can be challenging, particularly depending on wind or if road surfaces are soft.